As part of a bigger production deal with ABC (which led to The Muppet Show pilot in 1975), Jim was part of a show produced jointly by Henson Associates, Children’s Television Workshop and ABC called Out To Lunch. Involving the casts of Sesame Street, The Electric Company and Elliot Gould, Carol Burnett and Barbara Eden, the show was a fun project but not the Muppet-centric program Jim envisioned. He and Jerry Juhl discussed other options for ABC and apparently came up with what Jerry described as “the whacky Kermit film,” but they didn’t think the network would go for it. 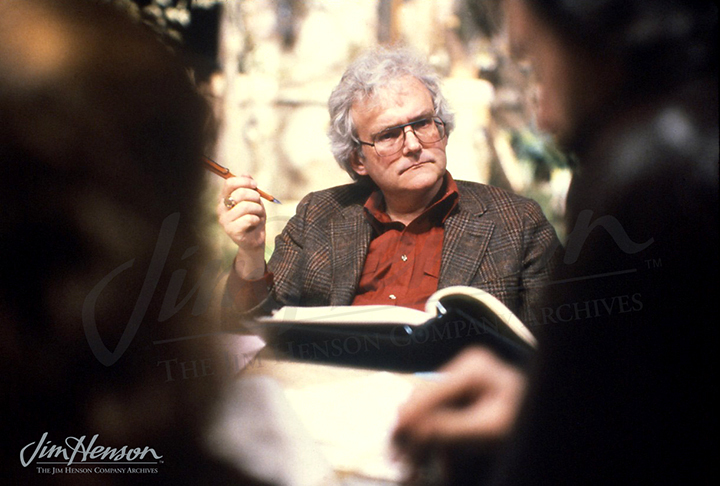 Jerry then wrote a concept for something that was, in his view, somewhat tamer, “…more like something ABC might be interested in (no political overtones, etc. ).” Jim and Jerry seemed to be chafing at the network’s restrictions so, of course, their idea was a parody of what the networks regularly aired. Jerry titled it (tongue firmly planted in cheek) Made-For-TV Movie. According to Jerry’s treatment, certainly one of his silliest, “The main action of the film takes place at a Malibu beach house, because independent research has shown that all Made-For-TV movies take place at Malibu beach houses.” Kermit the Frog plays a police detective investigating the disappearance of a guest at the house during an Ouija Board session. The cast is a mix of humans (the residents and guests of the house) and Muppets (Kermit and the bumbling police officers that accompany him) and the mystery revolves around a recently purchased Egyptian sarcophagus that may or may not hold the missing guest. Ridiculous coincidences ensue; there are roles for Thog, Taminella, and King Rupert II from Hey Cinderella! and The Frog Prince, and the shaggy sheepdog Rufus plays a solo on the harp. About halfway through, according the Jerry’s descriptions, “The spirit of a cranshaw melon possesses Butterfield [the antiques dealer played by Thog] who runs amok.” (Jerry helpfully explains, “A mok is about a mile and three sixteenths.”) After some confusion about whether or not the (human) Police Commissioner who has joined the group is dead, the missing guest reappears, and Kermit claims credit for solving the case. Jerry finished with, “Through it all, Kermit tries his best to be the dignified, Made-For-TV detective. He also converses freely with the camera, commenting on the action and keeping careful notes on the number and lengths of commercial interruptions.” While Kermit, Thog and Rufus all appeared on ABC in The Muppet Valentine show a few months later, Jerry’s concept did not make it to the screen. Kermit did eventually get to play a hard-boiled detective, however, on the Lisa Minnelli episode of The Muppet Show written, of course, by Jerry Juhl. 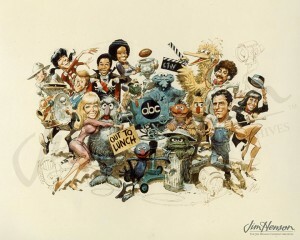 Learn more about Out to Lunch and Jim’s deal with ABC and Liza Minnelli’s Muppet Show episode. Jerry Juhl, looking uncharacteristically serious. 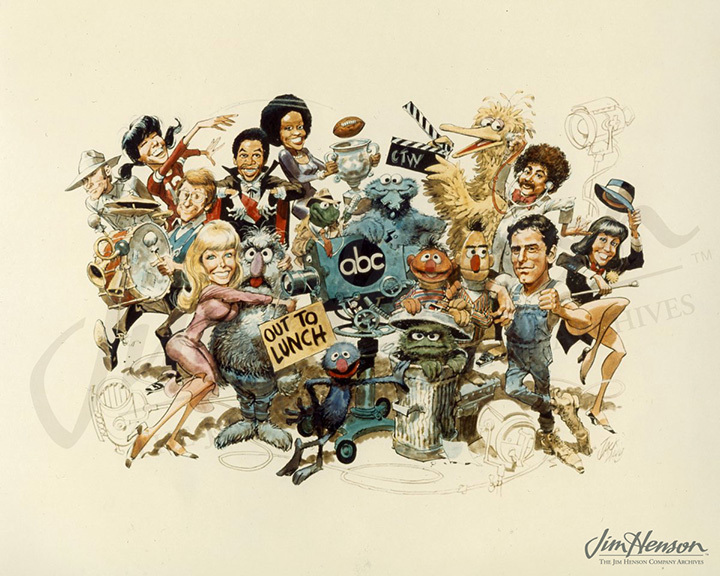 Jack Davis’s promotional art for Out To Lunch, 1974. This entry was posted in 10-October '74, 1974 and tagged Barbara Eden, Carol Burnett, Children’s Television Workshop, Elliot Gould, Hey Cinderella, Jerry Juhl, Kermit, Out To Lunch, Sesame Street, The Electric Company, The Frog Prince, The Muppet Valentine. Bookmark the permalink.